We’ve been redecorating recently, and are now on the way to returning to normal living. It’s been very disruptive for several weeks, because we have a small apartment so there’s only so much juggling room when we need to move furniture out of the way. This has forced us to live rather differently (that’s a euphemism and a half! ), but it has been a good opportunity to observe habits and routine behaviours and practice patience and contentment even though things are not quite as we’d like. The yoga of redecorating? Why not! This post is a few observations from this experience — more or less yoga related. First up the physical as pects of work. I’ve been doing some painting as you can see from another glamorous shot (not!). I was jumping up and down on a stool for a few hours, balancing, and painting mostly left-handed since my right shoulder’s a bit dodgy. That I could do all this hopping about was an unexpected benefit of asana practice! And I was conscious in my movements in a way I’ve never been before (moving, balancing, stabilising). Wielding a paintbrush isn’t an extreme sport I know, but I felt genuinely grateful in my body. Injuries will happen though and Hubby probably broke a toe just by stepping down awkwardly (ouch!) and I’ve twanged my delicate hamstring a little through some ill-considered furniture moving. Bah! Clearly not conscious enough! Hubby let me loose with the roller (the easy bit!) while he did this beautiful peacock wall. A little act of daring since we were really not sure about the colour, but I love it now and I think I’m going to take pleasure in it every day. I’m proud that Hubby has been recycling materials to build some recessed shelves and turn an awful 1980s serving hatch into a pretty neat feature and we sourced the wooden floor from sustainable forests — a small plus for environmental ahimsa, even if the paint we used smelt pretty toxic and we didn’t research for anything more ‘green’ (no pun intended!). I wish we had, even just selfishly because the smell might not have been so bad! I can’t wait to be able to move back into this room properly, but we’re boringly held up from that for a while yet and are continuing to live with furniture in unusual places. 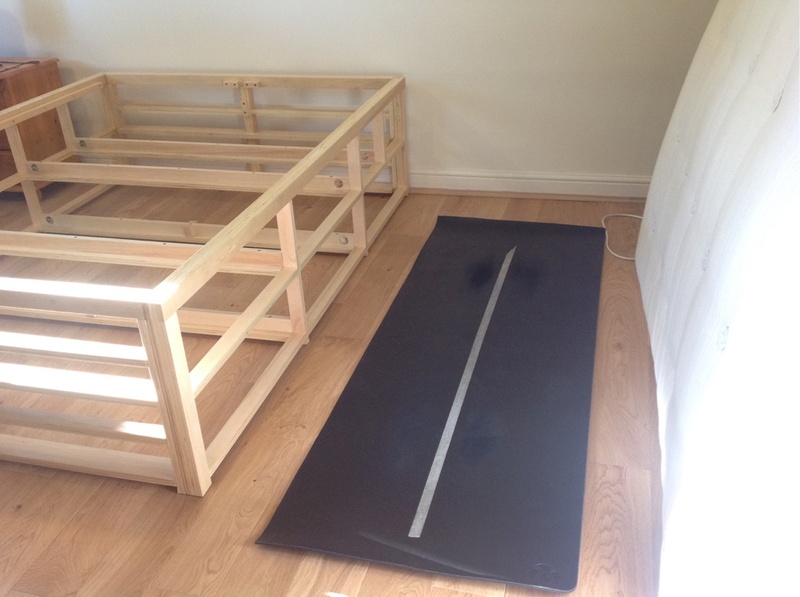 So recently practice has been squeezed in between a partially-constructed bed frame and a mattress(!). But I am grateful to have even this space. It was sufficient once I’d swept the floor free of dust and was a good reminder that I can create a sense of space through my practice; I don’t actually need that much physical room to do it, nice though that is. And if I close my eyes during practice, it all goes away. On attachment: we did think long and hard about our furniture — what to keep, what not to keep. Some items had sentimental value from our early years together, but don’t quite fit our needs now. I resisted the urge to cling on to everything and we gave some pieces to Emmaus, a charity that works to end homelessness and is always in need of good quality furniture. 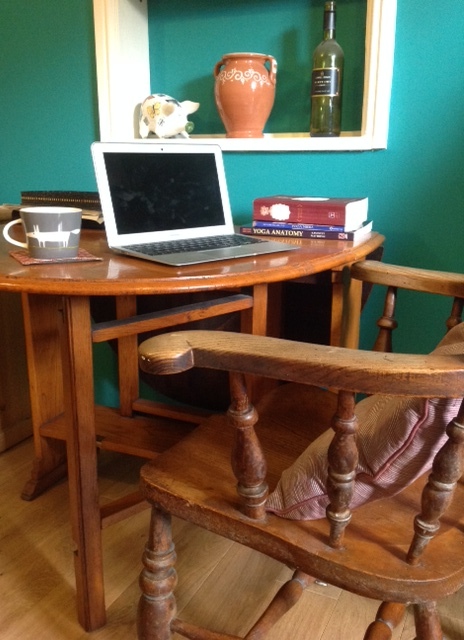 I’m pleased we agreed to retain a simple handmade table (we got it from a charity shop and I remember we almost killed ourselves carrying it home) — it goes nicely with a chair I inherited from my childhood neighbour and gives me a place to write and study. I argue that I need this space, but more than that the memories of mine held in the wood are too great for me to let go. I doubt I’ll ever be so enlightened that objects don’t matter to me. It’s been interesting viewing the decorating through the lens of yoga. But now that we’re a whisker away from being finished I’m craving that moment and I’m looking forward to the possibilities offered by a minor reconfiguring of our space.